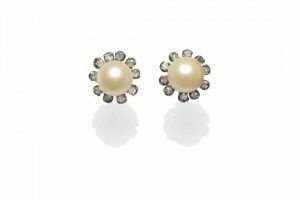 A Pair of Cultured Pearl and Diamond Cluster Earrings, each cultured pearl centres a spaced border of eight-cut diamonds, with screw-post fittings for pierced ears. 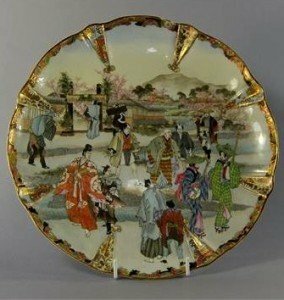 A Chinese rice bowl and cover. 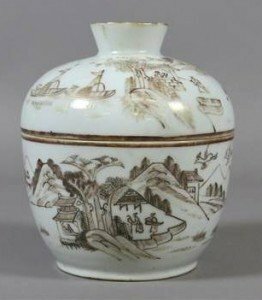 Painted in monochrome with a landscape scene and with seal marks. 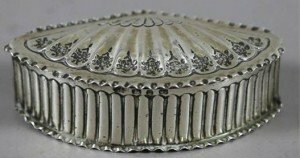 A Victorian Aesthetic Movement silver snuff box by Nathan & Hayes with crimped edges and reeded sides, gilt interior and chased to the cover with a fan. 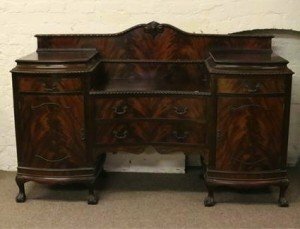 An Edwardian figured mahogany pedestal sideboard. With gadrooned mouldings, incorporating a cellarette and raised on ball and claw supports. 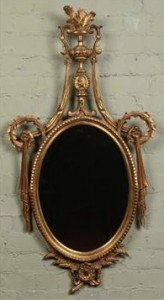 A twentieth century neo Classical style giltwood oval hall mirror. Surmounted with an urn shaped finial and flanked with scrollwork and ribbon drapes, 123cm. 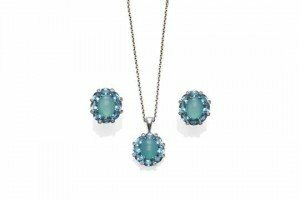 A Cluster Pendant on Chain, a greenish coloured cabochon within a border of oval blue topaz stones, with diamond accents, in white claw settings, on a plain polished pendant bale, measures 1.8cm by 2.6cm, on a 9ct white gold fancy link chain, length 45.5cm and A Pair of Earrings, en suite, with post and clip fittings. 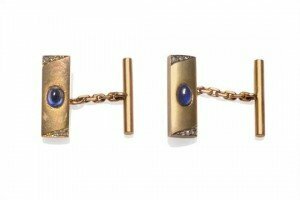 A Pair of Sapphire and Diamond Cufflinks, oblong heads inset with an oval cabochon blue sapphire and rose cut diamonds to two corners, chain linked to a plain bar. 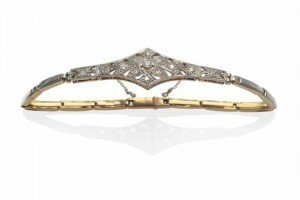 An Early 20th Century Diamond Plaque Bracelet, the pierced plaque set with old cut and eight-cut diamonds, in white fronted settings, on an expanding bracelet. 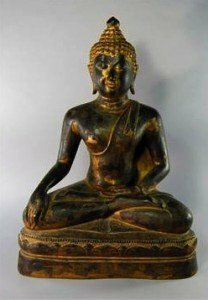 A large Thai bronze figure of buddha sakyamuni, 18th/19th century, modelled seated in Vajrasana on lotus throne, with traces of gilt lacquer throughout, 74cm high. 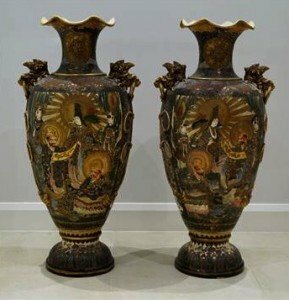 A large pair of Japanese Satsuma baluster vases, c.1920, elaborately painted in enamels with two panels of figures on a floral ground, with gilt lion and ring handles suspending fized ribbon swags, 108cm high. 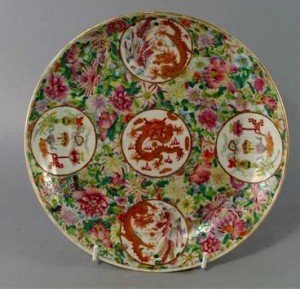 A large Chinese porcelain famille rose medallion dish, Guangxu mark and period, set with five medallions painted with dragons, phoenix and auspicious objects on a millefleurs ground, with traces of gilt to rim and painted to the underside with chrysanthemum blossoms, underglaze blue six character Guangxu mark. 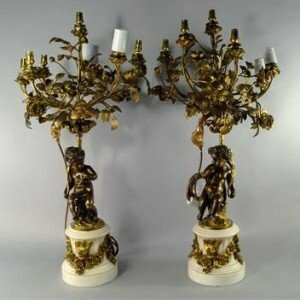 A pair of French Louis XVI style bronze and white marble seven light candelabra, late 19th/early 20th century, the bases formed of seated cherubs on waist form fluted marble bases, applied with gilt metal floral swags and birds, the cherubs holding branches emitting trailing foliage terminating in floral sconces. 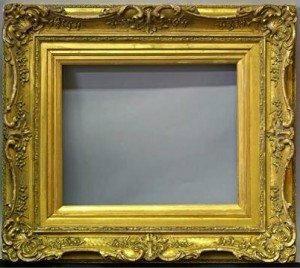 An English Gilt Composition Louis XV Style Swept Frame, mid 19th century, with gilded slip, cavetto sight, frieze, leaf course, torus, hand-tooled hollow with foliate cartouche and flower head centres and corners, stiff leaf back edge. 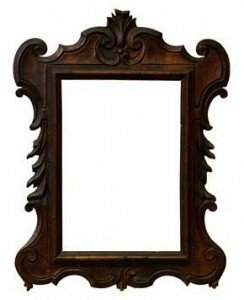 An Italian Carved Nutwood Baroque Tabernacle Frame, early 17th century, with cavetto sight, plain front edge, bolection, plain frieze, the corners with shaped volute scrollwork, flanked by draped leaf and surmounted by centred leaf. 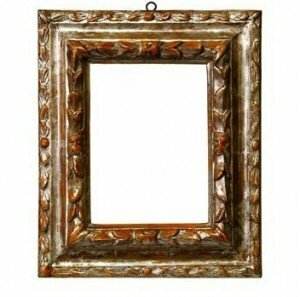 An Italian Carved and Silvered Frame, 17th century, with cavetto sight, the front edge with centre tied raked laurel leaf, reverse scotia, raked olive leaf with centred lozenge back edge. 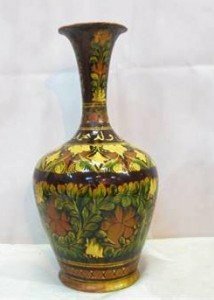 An early 20th century Indian pottery marriage vase, the neck inscribed “Muhammad” the body decorated with scrolling foliage. 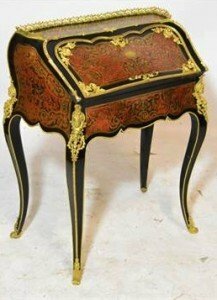 A fine 19th century boullework bureau de dame of bombe form, the raised pierced three quarter gallery above hinged fall front enclosing three drawers and sliding well raised on square section cabriole legs with ormolu mounts throughout and scrolling sabots. 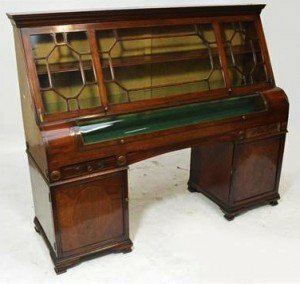 An unusual 19th century mahogany display cabinet, the dentil moulded cornice above astragal glazed boxwood strung hinged upper compartment and domed glazed door beneath revealing a baize lined and shelved interior, overall mounted on a concave frieze drawer flanked by two short drawers above oval inlaid cupboard doors raised on ogee bracket feet.